Aruba is a tiny little island that sits 18 miles off the north coast of Venezuela in the Caribbean sea. It’s just 20 miles long and 6 miles wide, but a treasure nonetheless. Check out our list of the best things about Aruba, below. 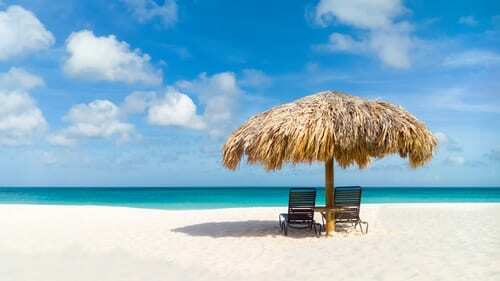 Although just about all Caribbean islands can claim to have fantastic weather, Aruba still has them all beat. You see, Aruba has a ‘party piece’ that few other Caribbean islands can match – it almost never gets hurricanes. Aruba sits so far south in the Caribbean sea that it sits outside the generally accepted ‘hurricane zone’. So, while you take your chances with the weather when visiting the rest of the Caribbean between June and November, with Aruba you’re almost certain to have blue skies and still seas. Aruba’s best known beach is Palm Beach on the west coast of the island, but this can get a bit crowded – it’s where most of the big hotels are located. Luckily there are plenty more beaches where you can get away from the crowds and enjoy some tranquil Caribbean scenery. Our two favourites are Eagle Beach (just to the south of Palm Beach) and Baby Beach on the southeastern corner of the island. Both beaches are considerably less crowded than Palm Beach, both have beautiful fine sand and both have great swimming conditions. At weekends, especially on Sundays, just about all the beaches on Aruba get that much busier as the locals take a well deserved break and join in the fun, but you’ll still find plenty of space to relax and enjoy the sun. For such a small island, Aruba has an excellent selection of accommodation for most budgets and for most needs. For those looking for a touch of luxury, the recently opened Ritz-Carlton Aruba would be a great choice. One step down on the luxury scale is the Hyatt Regency Aruba and if you’re looking for an all-inclusive option the Riu Palace Aruba is a good place to start. This is also a great option for families. Other great all-inclusive options for families include Barcelo Aruba and Holiday Inn Resort Aruba. Aruba has a little bit of everything so it won’t be hard to find something that suits your taste. If you’re in the Palm Beach area (which most people usually are) and are looking for a sunset dinner on the beach, try Simply Fish is one of the better options around. For fine dining, the Flying Fishbone is a ‘must’. If you’ve ever thought about trying out scuba diving but just haven’t got round to it, this is the place to do it. While most dive charters offer dives on the west and south coasts of the island, the west coast is the one to learn on while the south coast will be more fun for the experienced diver. From shallow reef dives with plentiful sea life to dives on WWII wrecks (The Antilla) you’re not going to get bored! Add to that the fact that the waters can be so warm that a wetsuit is surplus to requirements and you have the perfect location to learn to dive. The island has branded itself “One Happy Island” and Aruba truly lives up to this moniker. The people on the island are remarkably friendly and always seem to have a smile when you meet them. You can’t understand the warmth and hospitality of the locals until you visit for yourself! To book your own Caribbean adventure, call us at 402-281-3022.